Unfortunately, for the second time within two years I find myself in the unfortunate position of looking for work during these difficult economic times, due to being once again made redundant due to centre closure where I previously worked. I am a qualified post-16 Tutor / Trainer, learning practitioner, educator and IT specialist based in Plymouth, UK. If any prospective employers are interested in utilising my skills, experience, knowledge and qualifications in the areas of delivering, managing and supporting e-learning, learning and development, training, project based roles, IT and Internet or any other relevant vacancies then please view the following work related activities and content available on my website, blog and other social media that maybe of interest. I thank you for your interest and look forward to hearing from you regarding any possible job opportunities. UPDATE: Since this blog post was published I have successfully secured employment. I have been working with this employer on site at their Head Office based in Plymouth to advise about the best solutions for their training and learning needs, deliver, support IT courses and qualifications as well as carry out testing. Training and learning opportunities delivered include the BCS ECDL Essentials, ECDL Extra, OCR ICT Skills For Life: Entry Level Certificate and Adult Numeracy: Level 1 and 2 Certificates utilising a flexible approach to suit the workload of staff. Pipex Ltd is a successful award winning innovative company who design, manufacture, supply and install a variety of products from warship piping to wastewater products. They recently published a news article on their website regarding the first members of staff to complete the qualifications I’ve been delivering and supporting, as shown below. 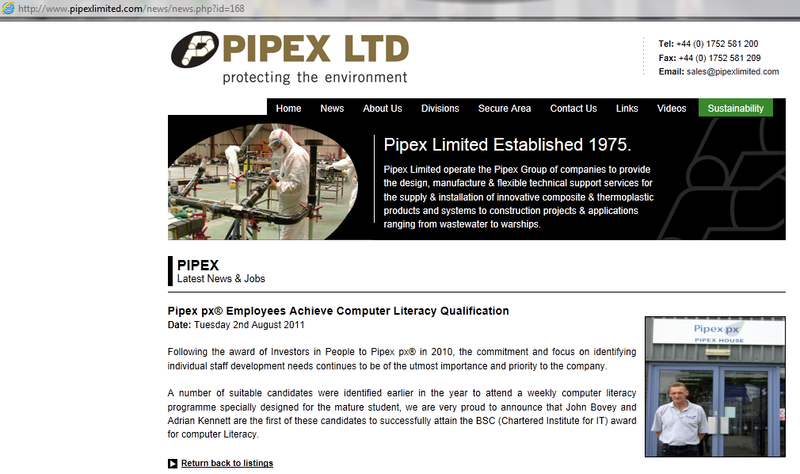 I still continue to work with staff at Pipex and the positive relationship continues. I wish them continued success with their course and working towards the qualifications. This blog post article discusses using tablet computing devices within learning environments, with a particular focus on the new HP TouchPad, which is the first webOS tablet from HP (formerly Palm). When referring to learning environments within this article, this can be in relation to teaching, learning, e-learning and other educational settings. I have focused on the HP TouchPad to give this article a single device to feature and feel the TouchPad is an excellent tablet device solution for use within learning as well as other personal and work related settings for a variety of Internet, email, entertainment, gaming and other uses. Other reasons why I have chosen this device include being a long time user of webOS operating systems (OS) ranging from the early Palm OS to the latest webOS version and feel given the background and experience of the OS it has the edge over other rival tablet devices. The article features an introduction to tablet devices, the benefits, a few brief comparisons and summary, whilst focussing on their use within a learning environment. As a definition of a tablet, slate, tablet computer or device, it is the term used to describe a type of portable all in one computer in a form factor similar in size to a notebook or netbook computer. Due to this, the device resembles a ‘slate’ or ‘tablet’ and features a touch-screen interface and on certain models a stylus for input purposes. Although the HP TouchPad is a late arrival to the tablet market sector as other major companies already have their established tablet devices available. One of the biggest benefits compared to the main rival iPad is the Adobe Flash Player support, which will allow the user to view a variety of Flash based content and sites. This is an important factor within a learning setting, as it allows access to a variety of e-learning content and learning modules, Learning Management Systems (LMS) and testing systems. By supporting Flash content, it makes using a tablet device within education a real, practical option, making a variety of learning related content and systems usable. Due to the TouchPad supporting Flash content, this is a major point compared to other rival devices, such as the iPad as this doesn’t support Flash content. Although my personal opinion of this difference is that Apple is such a big company and has a big market share that eventually it will need to support Flash content or there will be a shift by websites and developers in how content is made available in a variety of formats to accommodate users of the iPad. In addition, it also must be noted that Android operating system based tablets support Flash content. Another benefit of using the TouchPad compared to other tablets is the multi-tasking capability, enabling you to have a variety of windows or ‘cards’ (as they are called in webOS) open for all your active work. For example, email, Learning Management System, attendance and learner tracking spreadsheet could all be open at the same time. Although it is possible to type using the on screen virtual keyboard, I personally wouldn’t want to type for long continuous periods on a tablet touch screen. However, if it is necessary to type for such periods, then a wireless keyboard is available for the TouchPad with a predicted battery life to last up to several months. A big benefit of the wireless keyboard is that it allows you to type comfortably whilst being able to view the entire TouchPad screen. Again, accessories such as a keyboard are available for other tablet devices. Another feature is the ability to print wirelessly as long as you have a compatible printer. In terms of accessibility, due to a disability or other difficulties, then the TouchPad tablet is flexible in being able to resize the on-screen keyboard to your own preference (extra small, small, medium or large) or alternate between settings depending on the task being carried out. For example, if replying to an email you may want to view most of the screen and have a small keyboard displayed. Through a variety of apps you are able to expand the use of the TouchPad further. When more apps become available, such as dedicated apps specifically for use within teaching and learning environments for a range of tasks, that could include: recording attendance, links to resources or interactive whiteboard materials as well as being able to access resources such as Moodle. In addition to the TouchPad tablet, the Pre 3 smartphone will shortly be available following the launch of the TouchPad which runs the same OS and through Touch to Share technology, the devices link together in order to continue working on a smaller screen if access is required on the go via the phone. The useful Touch to Share feature works by tapping the phone onto the TouchPad to allow the content on screen to be instantly transferred to the other device. Due to tablet devices being extremely portable and the Touch to Share feature, they are convenient to move between teaching rooms, providing the ability to take email, calendar and other work with you to continue working and receive notifications. Other accessories, such as the Touchstone charger offer additional flexibility of simply placing the tablet down on the stand and will charge and top up the battery wirelessly via conductive technology. This avoids the need of physically plugging it in when in a busy environment and ensures it is ready for the next session or use. E-book reader apps, such as Amazon Kindle can also be seen as a learning tool, as you are able to access reference books for your studies or read training books on the tablet whilst being able to perform actions away from the TouchPad. Due to them being e-books, some books may contain interactive features, such as demonstration animations and video to be fully immersed than a traditional book. Past experience of similar tablet devices used in a teaching, training and learning setting, include the ‘el-box’ which is a service offered by ThirdForce to offer ‘E-Learning in a box’, allowing e-learning to be delivered conveniently via a hardware and software solution using tablet devices. This is an ideal solution, when having to travel to different sites and deliver sessions as well as in workplace learning, where space maybe at a premium. From a learning point of view using a tablet could be seen as being more flexible, portable, convenient and enjoyable, allowing learners to continue learning where traditional computers and laptops aren’t possible. Due to the compact size it allows learning if space is restricted in a learning area and is ideal for m-learning (mobile learning). Tablets can also be used for the basis of the actual session topic. For example, I’ve delivered sessions allowing learners to be aware of the various benefits of Social Media and seeing how it is relevant for their particular lives. By utilising tablets, you would be able to cover the same topics of VOIP such as Skype, using the camera when covering Social Media, IM (Instant Messaging) and conferencing topics with learners. By integrating tablets within the sessions and learners using them, it allows them to become familiar with this new technology and continue to work towards bridging the digital divide. As mentioned within this article, there are a variety of uses from a teaching, administrative point of view as well as learners using tablet devices for their own learning. Other uses could include being able to conduct enrolments flexibly and unobtrusively, especially when present at an open day promotional event away from the main campus site. Another idea could be to use tablet devices within class as voting tools for a variety of educational quizzes, ice breakers, assessments and other activities. I believe tablets can be used in all sectors of education, whether primary, secondary, post-16 or workplace learning. Especially convenient for training and assessing in the workplace for recording actions of the learners whilst being able to move around with it, due to its space saving size and form factor. It is also a useful flexible tool for assessment purposes and to record progress, as the included camera could be used for evidence purposes, where as compared to using traditional methods, you would need to use a computer, which is probably away from the required work area, separate camera and then upload pictures to record assessment evidence. Tablets can be useful in a variety of different contexts, however still continuing the learning theme, another idea could be to use the tablet as a guide. For example, tourist information, museum guides incorporating audio, visual, text, flash animations and even augmented reality content (ability to look at something on tablet through camera and view a variety of information and additional content) which makes learning more fun, relevant and memorable. Due to being more interactive than traditional paper guides, it would be a preferred choice allowing a range of leaning styles and preferences to be accommodated. 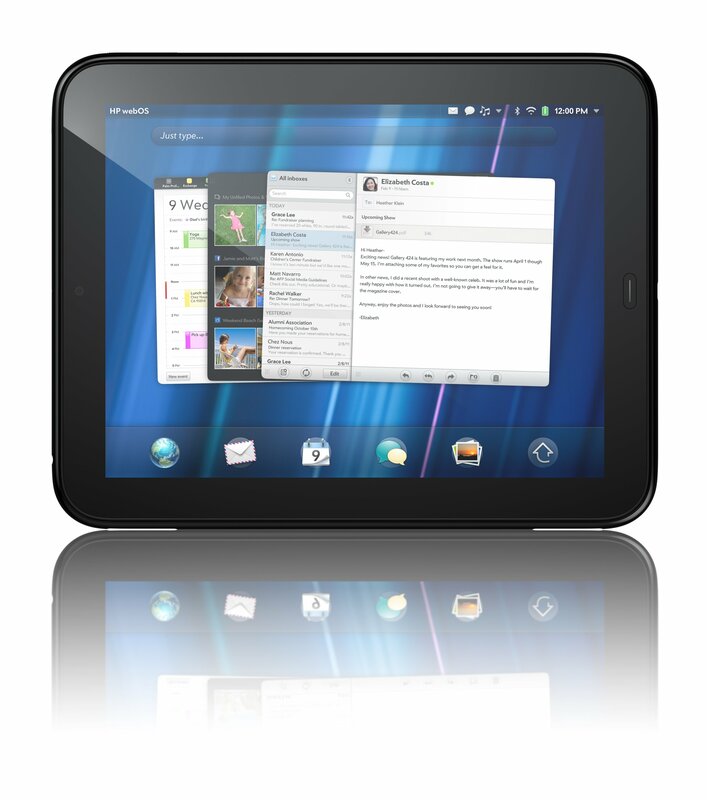 The HP TouchPad represents an innovative user interface and experience, due to utilising the webOS operating system and is a pleasure to use and navigate around whether using it for entertainment, personal or work use. However, when considering its use within learning and teaching settings then it makes learning convenient, as you can continue to access and engage in activities anywhere due to Wi-Fi and even more so once the mobile connected version is released at a later date. It offers a true mobile and non-mobile learning experience, that through using the tablet adds to the learning experience. Through a variety of educational apps the possibilities are endless in terms of being able to support a range of learning tools and resources. Over recent years, tablet devices have become a popular new market area and in the future I believe they will continue to grow further for general use as well as within specialist areas such as learning, teaching and education as discussed in this article. Although webOS tablets are imminently about to launch and enter an already established competitive market, I highly champion the OS and believe eventually it has the potential to have the edge over other rivals. As the webOS platform continues to develop I will continue to publish a series of articles focusing on its use within education. Finally, I hope this article has been of interest to anyone interested in using technology from a learning and teaching perspective as well as exploring the potential impact of tablet computers in education.